The journal “The Physics of Metals and Metallography" publishes papers in the field of experimental and theoretical studies of the structure, electrical, magnetic, thermal, optical, mechanical, and other properties of metals, metal alloys, and compounds. The journal publishes scientific reviews and articles written by experts in the field of fundamental, applied, and technological research. The annual volume of publications amounts to 230 papers submitted from more than one hundred leading national scientific institutes. The journal was founded in 1955, releasing 13 issues per year (12 issues in Russian and English, and the 13th edition in English only). Founders: the Russian Academy of Sciences, the Ural Branch of the Russian Academy of Science, the Institute of Metal Physics. The journal is rendered into English by the International Academic Publishing Company (IAPC) “Nauka/Interperiodica” (Moscow) and is included in the list of World Translation Publications and leading quotation systems: World Translation Index, Astrophysics Data System (ADS), Current Contents/Engineering, Computing and Technology, Current Contents/Physical, Chemical and Earth Sciences, Science Citation Index, Journal Citation Reports/Science Edition, SCOPUS, EI-Compendex, INSPEC, Chem-Web, Google Scholar, Academic OneFile, Summon by Serial Solutions, Gale, OCLC, INIS Atomindex , Materials Science Citation Index, Science Citation Index Expanded (SciSearch), SCImago. 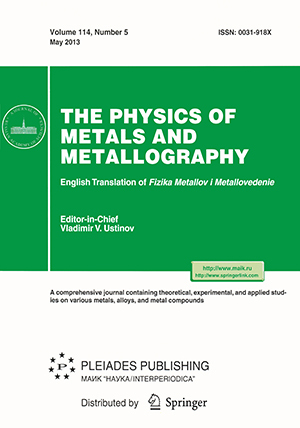 The name of the English version of the journal: The Physics of Metals and Metallography (ISSN PRINT: 0031-918X; ISSN ONLINE: 1555- 6190). 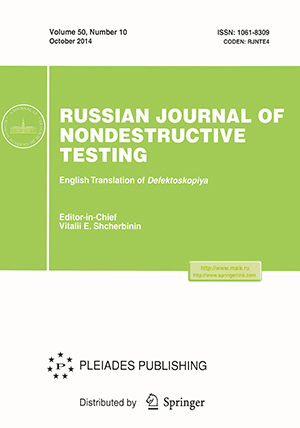 The journal “Russian Journal of Nondestructive Testing” publishes works on the physical principles and the latest developments in the field of non-destructive testing and technical diagnostics, as well as new methods and technical means of verification of products and various facilities, both under production and under service conditions. The journal was founded in 1965; it is a monthly journal. The journal “Russian Journal of Nondestructive Testing” is released and rendered into English by CB “Eurotrust”, Moscow, Profsoyuznaya St., 90. The journal is included in the list of World Translation Publications and leading quotation systems: Academic OneFile, Academic Search, CSA, ChemWeb, Chemical Abstracts Service (CAS), Computing and Technology, Current Abstracts, Current Contents/Engineering, EBSCO, EI-Compendex, Earthquake Engineering Abstracts, Gale, Google Scholar, INIS Atomindex, INSPEC, Journal Citation Reports/Science Edition, OCLC, SCImago, SCOPUS, Science Citation Index Expanded (SciSearch), Summon by ProQuest. The name of the English version of the journal: Russian Journal of Nondestructive Testing (ISSN PRINT: 1061-8309; ISSN ONLINE: 1608-3385).